Artist Graham Fink collaborates with Shanghai fashion designer Ziggy Chen on latest collection. Artist and creative Graham Fink has collaborated with Shanghai fashion designer Ziggy Chen on the new collection’s visual identity that references dualities within people and place. Fink reconfigured his imagery to create an immediate duality that occurs in any given situation – evoking our tendency for interchangeability based on external conditions and environments. Multiple exposure in the images creates a complex layering effect that builds on a shared interest of fusing history, memory and time into one single aesthetic vision. Stone Souls explores the psychological phenomenon of pareidolia—the perception of a visual or auditory pattern where there is none. Often associated with religious or intellectual epiphany, pareidolia is credited with helping the ancients to negotiate an unintelligible world through the interpretation of signs where there was merely chaos. We have since become predisposed to interpret abstract shapes and formations and to conclude stories from their fragmented clues – something that artistic movements such as Cubism and Abstraction, all knew and understood implicitly. For Fink, the phenomenon has become uniquely associated with his practice, which is intensely process-oriented. His work evokes the discovery of familiar shapes and renderings by viewers - even where none were originally intended by the artist. Fink draws on variations found in the diverse ecological and cultural systems he experiences when he travels. He sees faces in decay, in nature, in the developed and the natural - finding shapes reminiscent of physical structures, he photographs them. Fink reproduces these images onto the purest, white marble from the quarries of Thassos in Greece. The marble, a relic of times past, is drawn into the present and the figurative marks become interlaced with the annals of history. The rapidly changing landscape of urban China is the subject of artist Graham Fink’s solo photographic exhibition, opening at Riflemaker gallery in London on 1 February. Over the course of five years, the artist has documented various demolition sites in and around Shanghai – the largest city by population in the world. The photographic series communicates the enormity of the transition that is taking place there as the country moves increasingly towards a large-scale urbanization and more workers relocate for employment in the manufacturing industries. Not only are new cities emerging but immense urban renewal efforts are underway. These demolished areas sites are ‘exchange sites’, where the past is being obliterated and exchanged for the future, where a not-so-distant communism gives way to new ideas and structures – super skyscrapers, office buildings and new domestic ways of living. As a result, these sites are in constant flux – the entire areas are flattened to make way for new beginnings. The matte and gloss treatment in the series gives each image a painterly quality – shaping the human aspects, stories and ‘ballads’ that pervade these ‘exchange sites’ – wallpaper clinging to a wall, a child’s drawing on a remnant of what was formerly a bedroom a once favourite chair, now left for economy and industry to reclaim. At ART 15 – London Art Fair, Graham Fink sits behind a computer staring intently at a blank screen. Out of nowhere, lines start to emerge, slowly taking on the characteristics of disturbing and broken portraits of faces. This is Drawing with my Eyes, Fink's new performance+exhibition, where visitors can witness the artist using neither his hand nor any other instrument but his eyes to create his striking line contour images. In the new exhibition by Graham Fink, visitors experience for the first time the creation of images using ‘Eye-Tracking’. The artist will be ‘drawing’ live, using neither hand nor any instrument, other than his eyes. As he directs his own eye movement, lines appear on the page. He will achieve this with the help of software he developed in conjunction with Tobii Technology in China, specifically a Tobii ‘eye-tracker’. The technology works by shining infra-red light straight into the eyes. The reflections are recorded using multi-algorithms and filters which allow eye movement to immediately be translated onto a screen. 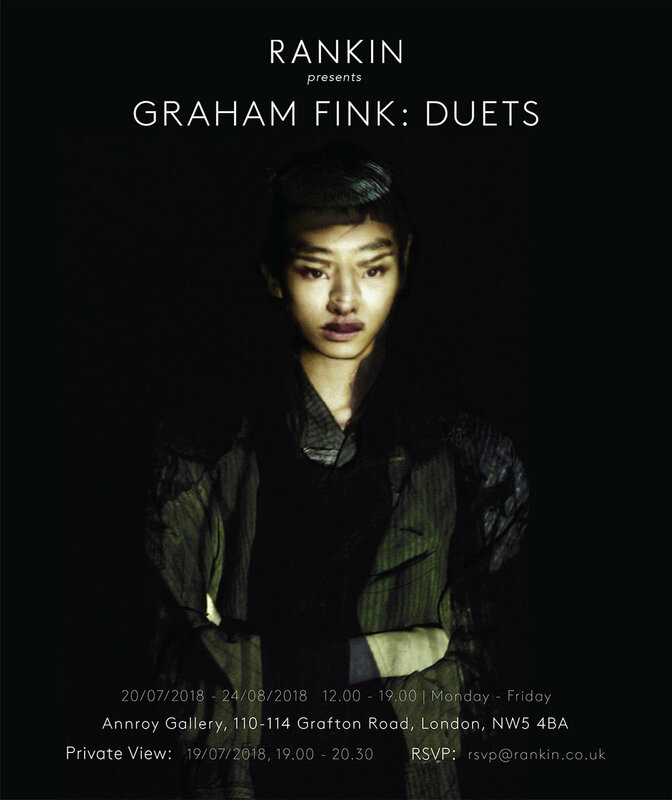 Graham Fink’s debut exhibition, Nomads, comes to Shanghai. Comprising 12 of the most insistent pareidolia printed directly onto slabs of Thassos marble. Also showing are 3 short animated films where the artist has scratched directly in the emulsion of 35mm film continuing his exploration of the ‘Nomadic line’. As with poetic images, so it is with the visual. Indefinite and fluid, they are all around. The child sees a face in the moon, ghosts in the sand, where the abstract becomes figurative, the throwaway becomes profound, the imagined real. Since childhood, filmmaker Graham Fink has seen faces; scratches in concrete, flaking paint, knots in the wood, clouds, fire; faces in everything. The apparitions grew and the spirits began to follow him. Like coincidental friendships, seeking freedom of expression in life as well as art. Fink recorded these ‘found’ characters, taking photographs everywhere he went. More than three thousand ghosts recorded over the years. The impact of an imagination deriving energy and meaning from an acutely sensitive response to the natural and supernatural world and the symbolism of the images which nature throws up. layers amalgamated in the printing process, one of the oldest known to man. The spirits take on another existence, becoming at one with the stone. As with the Aeolian harp, the music in the air, they are always waiting. All we have to do is look. Sign up for a private Email Newsletter and receive updates on future Exhibitions.